Disposing of dog poo can be difficult for suburban dog owners. Over the years we have tried practically everything, from wrapping and putting it in the rubbish bin, to the biological digesters that go in the ground. Nothing worked well — and in fact some were downright disgusting and nauseating! And then along came the worm farm — I bought a Reln Can-O-Worms and never looked back. We have a Hungarian Vizsla and a King Charles Cavalier. The worms happily eat through their poo. I wrote these worm farm tips for my sister, whose boyfriend has a Rottweiler, and thought why not post them on my blog too. Don’t put too much poo in the worm farm to start with. Wait for the worms to breed to a number that can consume all the poo that you put in there. Two to three days of food is all that should be in there. If it takes longer for the worms to consume, then reduce the amount of poo you put in there until the worms breed up. Do not put food scraps and poo in the same worm farm. 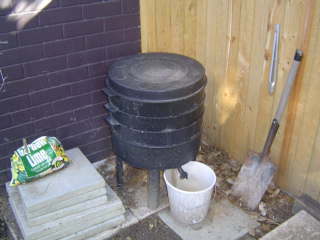 If you want to place food scraps in a worm farm, buy a second one and have one for poo and one for food scraps. Start the worm farm off with a coir bedding block. The block came with my worm farm. Tip a couple of litres of cold water in the top of the farm once a week. Leave the tap at the bottom of the farm open all the time with a bucket underneath. This will stop the worms drowning in the bottom chamber if it is not allowed to drain. Sprinkle a handful of garden lime in the top of the worm farm every week or two. This helps control acidity in the farm and breeding of other unwanted grubs and insects. Place several sheets of wet newspaper on top of the top poo layer. This keeps the top dark and the worms near the top of the farm. I keep a pair of BBQ tongs near the farm to use for moving the newspaper to one side before putting more poo in. The Can-O-Worms has three trays which can be rotated. When it is time to empty the farm, place the full bottom tray on the top of the farm. Leave the lid open for a few hours. The worms go away from light, so this will help the worms to go down to the lower trays before you empty the full tray. You don’t want to lose half your worms every time you empty a tray! At times the worms may seem to disappear from view at the top of the worm farm. Apparently this behaviour is to do with rain events. If concerned, check one of the lower trays. You will usually find that all is well with the worms further down. When you go on holiday, load the farm up with additional food and place damp newspapers over the top. Apparently worms can live for several weeks without attention if prepared properly. And the biggest tip of them all — don’t put any poo in the worm farm for at least a week after worming your dog!!! The worming tablet left in the poo may nuke all the worms in the worm farm! The farm should have a rainforesty smell if kept correctly — ie it should not stink! This entry was posted in Pets and tagged Worm Farm on 10 June 2007 by Rex. with close friends. Ofcourse, for some of which, others that are expecting their first child, they’d love to acquire the best possible branded apparels and accessories for their son or daughter not only to let them wear excellent and top quality clothing but to also cause just a little bit of envy amidst other female friends.